"Champion, the World's WONNDer Horse!" Gene Autry is a legend among Hollywood's Singing Cowboys. Champion a stocking footed chestnut stallion, appeared regularly in the sketch portion of Autry's Melody Ranch radio program. 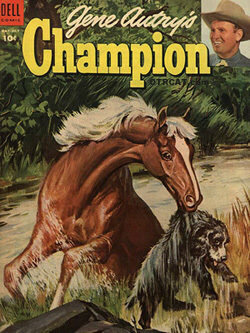 In The Adventures of Champion Autry's wonderful horse is the "King of the Wild Horses." The only person he will let ride him is a young boy, Ricky West. Ricky and his dog, Rebel, live on the Flying A Ranch with his adopted Uncle Smoky. Ricky, Smoky, and Rebel have a number of adventures and run-ins with bad guys, but because this is a kid's show, even the Bad Guys have a hard time killing anyone. "Flying A" was named for Gene Autry's Production Company. During WWII Autry temporarily left show business and flew cargo planes over the Burma Gap. Melody Ranch came to CBS TV from 1950 through the 1956 seasons. 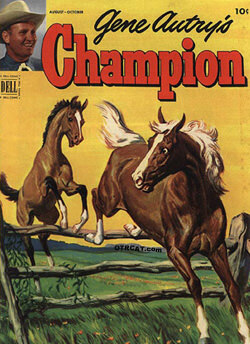 The Adventures of Champion were adapted as a TV spin-off for the 55-56 season. Be the first to comment on "Adventures of Champion"